I loved UBW then Heaven's Feel. Fate is pretty good though. Visit my Tumblr | Twitter | Wordpress if anyone wants to chat with me! Routes do not have equal standing. Well, one where saber stays with Shirou after the grail is destroyed, you know, like in ubw's ending. I thought it was such a kick in the balls for them to let saber stay as a 3rd wheel in ubw after denying us so hard in fate. But eh, that's just me. Personally I thought that the ending of Fate was good. It fitted the tone of what happened really well, gave Shirou and Saber the closure they needed, and wrapped things up nicely. It was a beautiful, albeit somewhat bitter-sweet, moment. nope not voting in.... All routes have their pros & cons & all of them have equal value for me.. I just cant pick one for the other. just CANT! I know Im weak.. I cant make hard choices like Kiritsugu. I cant sacrifice one for the other.. call me naive or stupid. Their fate was decided the day they were saved by a man in the fire.. Nothing could've changed it. Be grateful for the life you have & live it in the best possible way you want it to. This is a tough question. Though admittedly I'm wont to ignore Fate like most other people when this discussion arises, I think Fate's romance was very charming, if a bit uneven. I could see why somebody might stretch to claim that Fate is the best overall, but frankly that just sounds like a big hassle to me. That said, I'd like to give "massive props" to Fate for laying the foundation for UBW and HF. Much of what I enjoyed about UBW and HF is attributable to way they took the most basic rules and motivations set down in Fate and spun them in interesting ways. A lot of my favourite moments in UBW (Archer's betrayal etc.) wouldn't have carried the same weight without the most basic foreknowledge of Shirou's black and white ideals expounded upon throughout the Fate route. Fate was essential for establishing simple motivations for a seemingly simple cast of characters (compared to their representations in UBW and HF, anyway) before they gained breadth later on in the story, revealing the more difficult facets of their personalities as the tone of each story suited (which wouldn't have been as interesting if not for the events in Fate in my opinion, which is why the Ufo UBW anime felt a bit "undercooked"). I suppose I like all three separately for different reasons, but more than that I like all three when put together most of all. They each manage to carve out their own distinct atmosphere, while retaining cohesion. They compliment each other perfectly. Now that I've stepped around the question long enough, I'm going to come out and say that Heaven's Feel is my favourite route. While I think UBW is probably the best written overall, HF was such a left turn compared to the other two routes that it's hard for me to sit here and say that it didn't hold my attention the most, pacing problems and all. 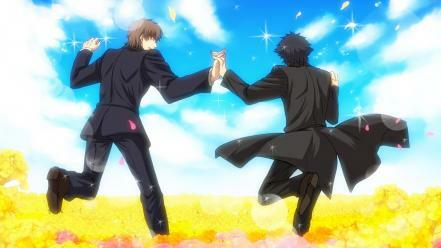 I enjoyed it immensely; the horror elements were a welcome addition, and the Kirei elements were ESSENTIAL. Seeing Shirou resolve to abandon his selflessness for selfish purposes was handled very well, too, as was the slightly harsher nature of Rin (which was interesting to see). The best part about HF for me though was that it took Sakura, who I'd previously written off as a ditzy piss-in-the-wind, and revealed her to be among the best characters in the game (in my opinion). The lead-up to the revelations about Sakura's past were great (Rin discovering the basement of worms was a small scene that sticks out in my mind), and to see her explode into fits of sadness and anger after 25-30 hours of docile cooking discussions was refreshing, and forced me to reconsider my entire opinion of her. In many ways, her motivations were blunt and far less complex than the other main heroines, but the circumstances which brought them about were so fraught with emotional turmoil that I couldn't help but be won over. But maybe I'm just a sucker for melodrama. Last edited by General Hospital; March 15th, 2016 at 12:03 AM. Personally, I think that HF is the best purely because it has some of the best moments in it and is all around fantastic, but it is not without flaws. UBW would be my next pick as it deals with a lot if moral stuff with lots of Shirou character development. However, my final statement will be that it is a tough question, all of the routes are somewhat reliant on each other to the extent that I feel picking one is unfair as without the others it may not have been quite as great. To be honest I feel that HF has the most memorable moments, but it also reminds me a lot of KnK for some reason and I really love KnK. Def fate, even if the ending pisses me off. i kinda felt tat abit of that sentiment too "two immovable mountains"
HF had the best/most memorable moments IMO. UBW was good but not as engaging. Fate was just okay. Fate works well as a standalone and HF brings closure and explores different stuff. UBW, well, it's cool and everything but it's kind of in the middle. Fate, because I'm a contrarian. Nah, just kidding. I just felt the romance in Fate was by far better handled than in UBW (where it took a huge backseat to Shirou's future daddy issues) and HF (the less said about Sakura, the better). You really felt the chemistry between the king who wants to sacrifice herself and the kid who wants to sacrifice himself both gaining some selfishness, clashing when they try to get the other to accede to it, but also eventually reconciling it and arriving at the final, bittersweet parting. UBW. Love that. Also Sunny Day because I love the route might as well cherry pick the ending while I'm at it.